Communiting mill machine manufactureres, we manufacture colloid mill state of art for milling it a high speed milling machine with output 800 kgs per hour. communiting mill is also called Cadmill, Fritz Mill , we also give spares for Cadmill and Fritz Mill. Communiting Mill Machine or popularly known as Fritz Mill or Cadmill We are one of the largest Pharmaceutical Machinery Manufacturer from India, Communiting Mill Machine is used in Granulation Department for making granules, and Communiting Mill Machine is most widely used in the Pharma Industry. We can get 800 kgs. Per hour depending on the product and sieve we used. 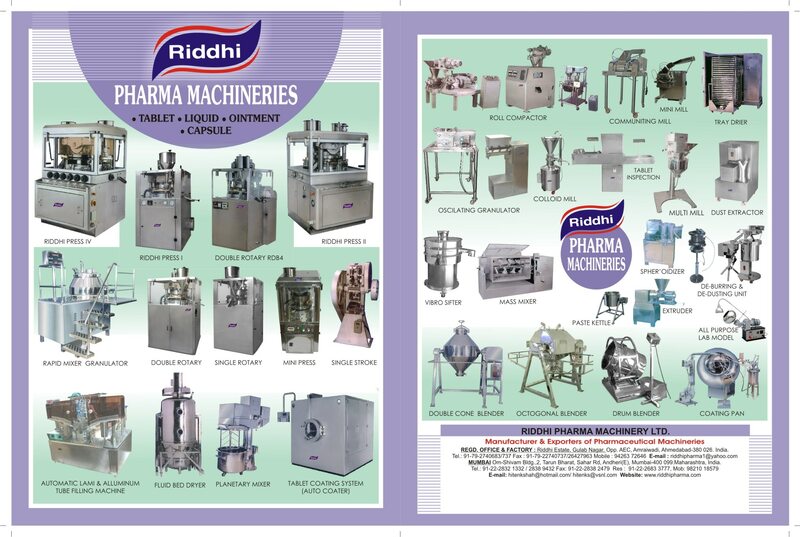 APPLICATION :Riddhi mill has been specifically designed for wet and drygranulation, pulverization or dispersion of products oringredients found in the pharmaceautical, Chemical and foodindustries.It is also finds application in Cosmetics, confectionery, Fertilizers, Insecticides, detergents andElectroflux Industries etc. DESCRIPTION Of Communiting Mill Machine:Latest improvements in design makes this unit a truely GMP model and Versatile in operation & maintenance. Unit consist of S.S.304 quality hopper, feed throat andprocessing chamber (can be provided in S.S.316 quality atextra cost ) with beaters assembly , heavy duty motor, star deltastarter with overload relay, three speed step pulley, suitable screen , S.S. cladded base having tubular legs with castors, optional jacket for the feed throat and processing chamber forcooling.OPERATION :Product kept in the hopper slide down to the enclosedchamber, where it is milled in between beaters and screento the required mesh/micron size which can be collectedat the bottom of the container.Quality and output depends upon the three main variables1) Beaters shape (knife/impact forward)2)Speed and 3)Screen size.Knife edge for coarse or large particles and impact or flatedge for finer particles. Highspeed for fine griding, low speed for coarser particles. A wide range of screens is available for various process needs. Communiting Mill Spares for all make like Cadmill, Fritz Mill, we manufacture beaters and all the required spares for communiting mill according to size and specification based on your sample. Communiting Mill Machine Manufacturers or Fritz Mill type Milling Machine or Cadmill type milling machine, we manufacture all type of milling machine for powder from 50 kg per hour to 800 kg per hour. Communiting Mill Machine Manufacturers , we manufacture communiting Mill which is also called cadmill, fritz mill , for high speed milling.